I’m David Murphy, Programme Executive for the River Thames Scheme, and this is my first blog. I’ve worked for the Environment Agency for 26 years in operational and national roles, managing flood risk across the country. I’ve seen lots of flooding over the years, including the worst cases in 1998, 2000, 2007, and most recently in 2014 which is still fresh in many people’s minds. 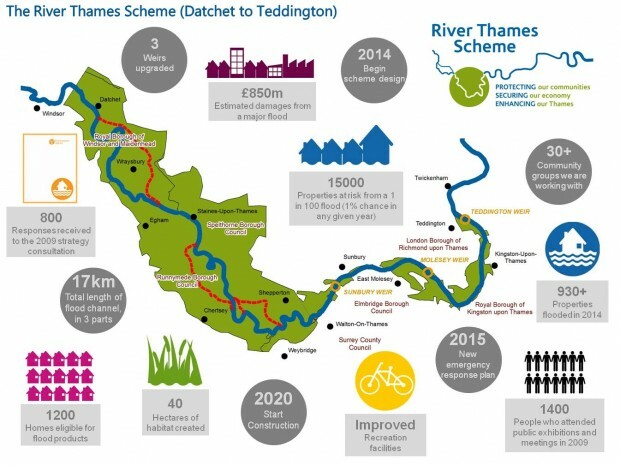 The River Thames Scheme will reduce flood risk from Datchet to Teddington through a proposed programme of projects and investment in communities near Heathrow. Click on the infographic to view the benefits of the scheme. Over 15,000 homes and businesses within the area are currently at risk from flooding from a 1 in 100 flood (that is a flood with a 1% chance of occurring in any one year). The scheme will help reduce the risk of flooding considerably. Everyone within the area will benefit from a reduction in their flood risk once all the work is complete. It will also provide significant economic, social and environmental benefits, including new wildlife habitats and areas for recreation. working with communities to raise flood awareness and supporting them to prepare for flooding. Supporting them to produce community and personal flood plans, and to help them to recover from flooding afterwards. Over the last year we have made significant progress in meeting the funding challenge. The Government announced funding in the Autumn Statement 2014, including £60 million of additional funding for construction that is needed beyond the current 6-year investment planning period. This is a partnership scheme consisting of 7 local councils (Elmbridge Borough Council, Royal Borough of Kingston upon Thames, London Borough of Richmond upon Thames, Runnymede Borough Council, Spelthorne Borough Council, Surrey County Council, Royal Borough of Windsor and Maidenhead), the Regional Flood and Coastal Committee and Thames Water to develop the scheme. In January 2015, the 7 local councils agreed to commit funding for the development of the scheme up to the point of construction. The Local Enterprise Partnerships (Enterprise M3 and the Thames Valley & Berkshire LEP) both have been very supportive and are providing funding for the scheme as part of the current growth deal announcement in January 2015. We will continue to work closely with our partners to explore funding opportunities so the scheme can be constructed. Why does the "get in touch" email address rts@environment-agency.gov.uk not work! Hi Steve, I have tested the email and it appears to be OK currently. If you are still having issues you can use the general enquiries address as an alternative contact and entitle the email River Thames Scheme.